Tattoo Blog » Meet Mike Rubendall! 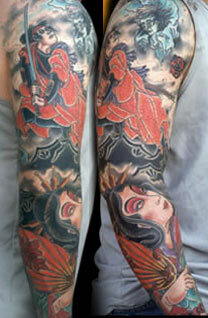 Tattoo Blog » Inspired » Meet Mike Rubendall! The first thing that I think of when I see Mike Rubendall’s superb tattoo work is the sense of flow in pretty much everything he does. It’s always there, a natural looking fluidity between image and flesh that highlights not just his own artistic ability, but also his ability as a tattoo artist. After all, tattooing isn’t just about the quality of the image on the flesh. Sure, that’s a big part of it all, but any truly accomplished and skilled tattooist understands the relationship between positioning of the image on the body – where and how the chosen image will look once it’s inked in. The tattoo work of Mike Rubendall is hardly some sort of underground secret. The guy is booked for up to 2 years in advance, with requests from all over the world. He’s been tattooing since he was 16-years-old (he’s 33 now), and came up in the tattoo scene when it still had that edge to it – that is, before shows like LA Ink and Miami Ink exploded into the mainstream. These days, Rubendall tattoos from his tattoo studio, Kings Avenue Tattoo in Massapequa, New York. He was born and raised in Massapequa, went to high school just seven blocks away from where Kings Avenue Tattoo now stands. Although Rubendall’s work is more of the Asian variety, the odd menacing snake or laughing skull can still be spotted amongst his portfolio and these images are given the same amount of careful positioning, flow, colour and definition as the most complex Asian themed back piece is. There is a focus to Rubendall’s work that makes the eyes follow the images to their completion, inviting or perhaps drawing you in to examine every last inch of it before making you silently mouth the word “wow” in appreciation.